Director – Brian Henson, Screenplay – Jerry Juhl, Based on the Novel A Christmas Carol by Charles Dickens, Producers – Brian Henson & Martin G. Baker, Photography – John Fenner, Music – Miles Goodman, Songs – Paul Williams, Visual Effects Supervisor – Paul Gentry, Muppet Performers – Dave Goelz, Jerry Nelson, Brian Oz & Steve Whitmire, Production Design – Val Strazovec. Production Company – Jim Henson Productions. On Christmas Eve in Victorian London, miserly Ebenezer Scrooge receives a visit from the ghosts of Christmas Past, Christmas Present and Christmas Yet to Come, each showing him the sentiment he is missing in his life and imploring him to change his ways. The Muppets are one of the iconic pop culture features of the late 1970s/early 1980s and made the name of creator Jim Henson. Following the death of Jim Henson in 1990 and inheritance of the Henson empire by his son Brian, the Henson legacy that Jim created with The Muppet Show (1977-81) fell into a sad decline. With the sole exception of the joyous tv series Dinosaurs (1991-3), all of the post-Jim Henson Henson efforts have only imitated Henson Sr’s former successes. Brian has tried to squeeze everything he could out of the Muppet franchise with six mediocre films – The Muppet Christmas Carol, Muppet Treasure Island (1996), Muppets from Space (1999), It’s a Very Merry Muppet Christmas Movie (2002), Kermit’s Swamp Years (2002) and The Muppet’s Wizard of Oz (2005) – and a lame revival tv series – Muppets Tonight (1996). In all of these, Brian has failed to realize that the Muppet phenomenon had hit its peak and faded more than a decade before. All might be forgivable if Brian Henson’s films were a spot on the original The Muppet Show or the first two Muppet movies – The Muppet Movie (1979) and The Great Muppet Caper (1981) – efforts that maintained on one level an inspiredly lunatic silliness for the kids and numerous sly asides for the adults. Unfortunately, Brian Henson’s Muppet films go through the Muppet moves with utterly predictability. Their usual kinetic vigour seems tired and the films lack any spark of inspiration. In the 2010s, The Muppets were subsequently taken over by Disney and revived for the enjoyable The Muppets (2011) followed by Muppets Most Wanted (2014) and the tv series revival The Muppets (2015-6). 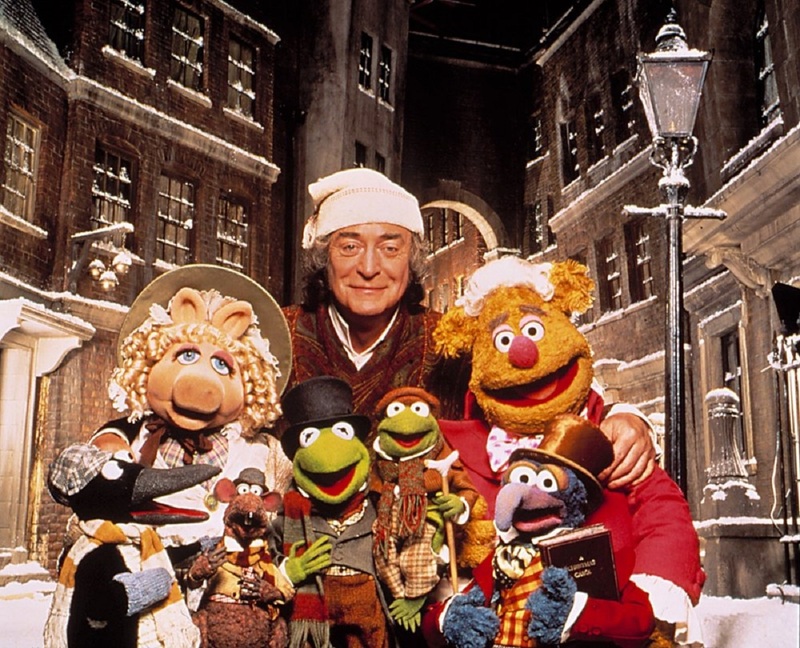 The Muppet Christmas Carol is an uneasy attempt to insert the Muppets into a retelling of Charles Dickens A Christmas Carol (1843), which has furnished some 40+ other film adaptations. Dickens gets a routine airing – there is no meanness to Michael Caine’s Scrooge and no real surprise or struggle to his eventual giving in to his good side. There is also the feeling that the story has had to be stretched to include the Muppets who are reduced to supporting characters, especially so the central characters of Kermit and Miss Piggy (who are cast as Bob Cratchit and wife). There are some occasionally amusing pieces – the suggestion that Scrooge’s first place of employ is in a rubber chicken factory run by all of people Fozzy the Bear; or how the two old grouches are cast as ghost of Jacob Marley – being two of them they have to come up with a name for the second, who in a sly aside becomes Robert (or Bob) Marley. Brian Henson includes some impressively flashy hi-tech morphing effects but these seem intrusive and out of place in the low-tech world of Muppet hand-puppetry. The range of songs from Paul Williams are unmemorable.